How can I play the Traffic Snake Game in my school? Have a look to see if the country where your school is located has a national focal point (NFP). Those NFPs can offer you a complete campaign set which makes it really easy for you to implement the campaign. Please find all the information on your country pages. In case your country has no national focal point, you are welcome to nominate a national organisation or yourselves (if you are a national organisation). Once this organisation contacts us, we can set them up as a National Focal Point. Unfortunately we cannot start up the campaign in a new country on request of one school. For more information you can of course always contact the TSG-secretariat. How can I organise the Traffic Snake Game in schools in my community? Have a look if the country where your community is located has a national focal point (NFP). Those NFPs can offer you access to all campaign materials and together you can implement the campaign in your community. Please find all the information on your country pages. In case your country has no national focal point, please contact the TSG secretariat and together we can start-up a try-out in your community. Who can organise the Traffic Snake Game? Only primary schools can play the game, but cities, regions, pedagogical networks, educational bodies, local organisations etc. can take up different roles in the organisation and dissemination of the campaign. Interested in becoming a local partner? Please contact the NFP in your country. Why do the schools have to set a target? Each school sets its own target. This is important to communicate to the pupils and to explore what level of change is possible on a school level. Of course it’s important to set a realistic target, so that pupils and teachers feel they are achieving change.campaign. Interested in becoming a local partner? Please contact the NFP in your country. When and how much data does a school needs to collect? How will this data be collected? Participating schools should collect travel date before, during and after the campaign. In total the travel data should be collected during 12 days. This data is collected per class via a hands-up survey. The answer to this question varies from country to country and can even vary within a country or between municipalities/cities. In general, we know that schools are at a very tight budget, so in essence we strive to make costs for the campaign as low as possible for schools. Contact your NFP to find out what the costs are. How to play TSG 2.0? Read more about the Smartboard view. Where do we see the gamification scoring concept? 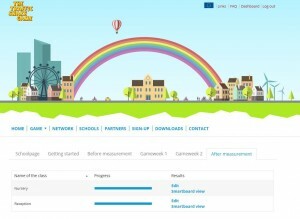 TSG 2.0 also includes a gamification scoring concept, which is attractive for both children and teachers. This is visible on the school pages as a cityscape header. The more sustainable trips a school logs, the cleaner the city will become through the course of the campaign. The more sustainable trips you log, the header at the top of your school page will change. Please note that this header is only visible when you are logged in. This header is not visible on your public school page. Playing TSG again in your school? In most countries schools have the option to play the TSG more than once, by signing up for a new edition. In order to do this, you just need to sign up again on your country page and select ‘we played before and want to play again’. You can then choose your school from the drop-down list and sign-up for a new edition. If you are playing again you can compare your current school results with the results of the previous year(s) on your school’s page.